Offers for financing furniture are everywhere these days. You’ll see commercials on TV, offers in stores, signs on streets, and more. I see them all the time, and I can't believe the “deals” they are promising people. To be honest, I have never once seen a good deal on furniture financing. I've seen offers for bed frames at $100 a week for a year, computers at $50 a week for a year, and so on. The low monthly payment is what pulls people in, but when you think about how long you will be making that payment, financing furniture and electronics becomes pretty unrealistic. Side note: Of course, there are always exceptions when it comes to financing and credit. 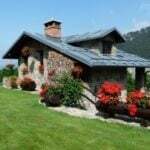 If you know how to take advantage of certain financing offers, then you may be able to come out ahead. However, if you know that you are not good at handling debt (which is probably the majority of the population), then it may be best to avoid offers like this completely. When we were looking at furniture a few years ago (before we moved into an RV), the salesman kept telling us that we could just finance everything and wouldn’t have to feel the pain of spending so much money all at once. The finance blogger in me probably should have slapped him because that is such a horrible suggestion. Furniture can be quite expensive, and it can be very easy to walk out of a furniture store with a huge bill. However, no matter how enticing those financing offers may be, please remember that you will eventually have to pay the FULL cost. Too many people get caught up when they think about the monthly payments, but it’s the full cost that is important. Here is why you should stop financing furniture. You'll pay more for furniture if you finance it. There's a reason why companies push financing furniture. They know that the average person will spend more money on furniture if they can have it financed. Furniture stores know that the average person will be more inclined to buy furniture if it's $100 per month, instead of $2,000 upfront. However, that's a bad way to think about spending money, as it just leads to debt! Financing furniture can also lead to spending much more than you originally planned for. By signing up for financing or paying for a purchase with a credit card, it may make the item seem more “affordable.” But, not having the money to pay for it up front is the opposite of affordable. Even if you can afford that monthly payment, it doesn’t mean financing furniture is the best idea. Financing furniture can lead to stress, a paycheck to paycheck lifestyle, delayed retirement, and more. No one wants to experience these things. 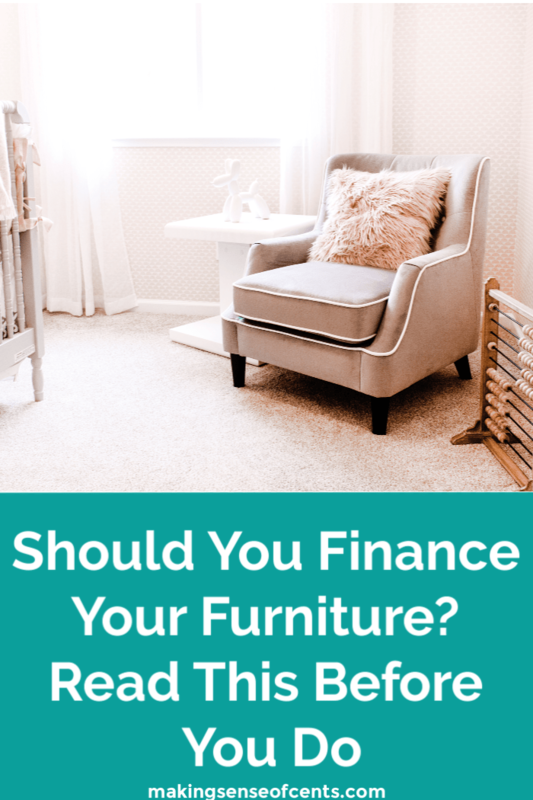 If you can't afford the furniture in cash, then you definitely should not be financing it. It's just furniture. And, it will lose the majority of it's value the moment you put it into your home. Furniture can be very overpriced. Furniture stores that provide financing or rent-to-own options usually have overpriced furniture. Because of the deals they offer, like the ones mentioned at the beginning of this article, the price is often inflated to three or four times more than the actual price if you would have paid for it with cash. The low payment is what gets people, but when you think about how long you will have that payment for, it almost always means you’ll be spending a crazy amount more. I mean, why would someone pay $3,000 for a $500 computer? Please think about the full cost of those monthly payments, and compare that total with what it would cost to buy that item upfront. That alone will probably make you want to run away from any financing furniture “deals” that you come across. If debt is the only way, then you can't afford it. The average person has a lot of debt– in fact, the average U.S. household has over $10,000 in credit card debt alone. There are loans for everything, and sadly, many only look at the monthly payment to determine whether or not they can make their purchase. Some look to debt as a way of affording things for the rest of their lives. Instead of being more realistic with their finances, many people even “budget” debt well into their future. Debt should not be normal. Just think about what life would be like if everyone was living debt free? What if we only purchased things we could afford? And, if we did need to take on debt, what if we were more selective and careful when doing so? You shouldn't have the mindset that debt is a normal part of life. 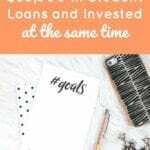 Normalizing debt can lead to thinking it’s okay to use debt to pay for everything instead of focusing on living debt free. You should make sure that you can actually afford the purchases you are making and not by just looking at the monthly payment. You should make sure you are fully analyzing your purchases, differentiating between wants and needs, and budgeting more realistically. If the only way you can afford furniture is to finance it, then you can't afford it. 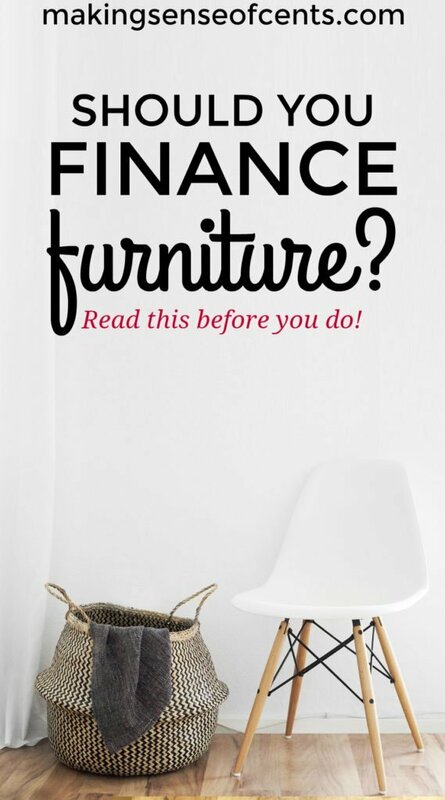 Financing furniture may prevent you from reaching other goals. A monthly furniture payment can add a lot of financial stress to your life. The amount of happiness you get from purchasing furniture can never match the amount of hardship brought on by debt. Usually, it's the exact opposite. Living debt free means that you are in control of the life you want. On the other hand, a furniture payment can’t bring that kind of control or happiness. You may miss a payment and pay hefty costs. While you might think that you'll never miss a payment, it could happen. Even if you think that you'll always have the money to make your payment, it is always possible that you miss it for one reason or another, such as just forgetting to schedule it. Missing one payment isn't hard to do. Many furniture companies require payments once a week, so you will be looking at something like 52 payments for a standard furniture loan. That's a lot of payments to remember to make! While you may think that missing a payment isn’t a big deal, many furniture financing deals have consequences if you miss just one payment. You may have to pay a large penalty, interest charges, and more. If you are thinking about financing, you will definitely want to read the terms and conditions of the loan. Many times their terms require you to pay interest charges for the WHOLE loan (starting from day 1), for just missing one payment. So, even if you are on a 0% financing plan, you may be required to pay the real interest rate (which may be 20% or more!) for the whole life of the loan, even if you are on one of the very last payments. That 0% interest rate may not look so good now. This is something that many people aren't aware of, and it can completely destroy your finances! You don't need unaffordable furniture. Some items are needs, but many of the things we buy are just wants. If you don’t realize the difference between your wants and needs, you may feel like you have to take on debt to fund your lifestyle. To me, financing furniture is a want. It definitely isn’t something anyone needs. Remember, the only things you actually need include a place to live, a certain amount of clothing, food, and water. There are plenty of other ways to furnish your home, and you don't need debt in order to do so! Use cash. Of course, I have to say this one first. You should use cash for furniture so that you know you can actually afford the purchase. Be smart with credit. If you use a credit card in order to get rewards points, make sure you pay it off ASAP! Look on Craigslist. There are probably several ads in your local area from people who are selling or even giving away perfectly fine furniture. You can get a really good deal this way! See what your friends and family are giving away. Many people have extra furniture that they'd love to give away! This is actually how I furnished my first rental – we didn't buy a thing! Do you have a home furniture payment? What do you think of financing furniture? I got really fortunate when I married my wife. She is super frugal and hates spending more than she has to most things. So we hunt down Craigslist for items that we want. Oftentimes finding them for 50-75% of the retail price. While sometimes it’s a pain to move it ourselves, it’s definitely worth it when we save hundreds, even thousands of dollars on gently used furniture. We’ve been on this extremes in the furniture situation. We had the 0% down situation (and fortunately never missed a payment), but we also purchased our last two dining room from Facebook yard sale groups. Yeah, nobody wants to pay $3k for a $500 computer. That’s insane. It also brings to mind people who “rent” furniture too. Another bad idea. But, we all need to learn these things and be smarter with our money. Yes, renting furniture is probably 99% of the time a bad idea. Exactly! The only way that I would rent furniture is if I was flipping a house and needed to decorate it temporarily for showings. Great post! I understand the desire to make your home truly yours and the need to use suitable furniture. But I never understand how someone would be ok with going into thousands of dollars of debt just to buy a nice couch to sit on. Mr. FAF and I have gotten so much free and hand me down furniture from our friends and the curbside. We put all of our extra money towards remortgage since we think it’s a much better investment than furniture, a depreciating asset. We haven’t bought new for awhile, the last 2 pieces of furniture we added to our house I built in the garage. 100% agree with ya on this post! You can find really nice used furniture, especially wood furniture. It lasts forever if it is taken care of. I agree with you. Sometimes it sounds very good when you hear: ‘Oh, it costs only 30 Dollars a month’. But at the end, you paid a lot more. And the reason is, with financing the companies making more money. A few weeks ago, a big company here in Germany announced that you can now rent electronic devices. So you pay 50 Euro a month for an iPhone. At first, this sounds good, if you don’t have 800 Euro for the iPhone. But at the end, it costs you much more and not even the money but also time. Ugh, rentals are almost ALWAYS a bad idea. We bought a house full of furniture back when we moved into the place in 2007. We financed it. They had either 12 or 18 months no-interest, same as cash. All we had to do was make sure the balance was paid off in full by the end of the period. We already had the money, and since that was the time when banks were paying actual interest on money, it was a no brainer. We just earmarked the money, earned a few hundred bucks by keeping it ourselves, and sent in the balance due with several weeks to spare. New furniture is one of my pet-peeves. It is so over priced, because of the ‘easy payment financing options’ and people just eat it up. But here’s the good news! Used furniture is a super bargain, many times. The same people that finance this over priced furniture are the same people that turn around and finance more over priced furniture, thus willing to sell their “old stuff” for pennies on the dollar. Just keep an eye on Craigslist and within a week or 10 days you will see some ‘quality’ pieces in ‘excellent’ condition at very reasonable asking prices. Recently, I decided to buy new furniture after deciding my 15-year-old furniture had run its course. Our deal was that we had 6 months to pay it off before the 29.99% interest kicked in. Naturally, we paid it off in four months, we didn’t want to risk incurring any interest but that because we were looking for specific type of furniture. On the other hand, for anything else like accent pieces, bedroom sets, etc. it’s best to go the Craigslist route or check out phone apps like Letgo or OfferUp but meet at a police station to trade off, if possible. You will get the best deals!! Lastly, don’t sleep on Facebook. I found a beautiful oversized piece of furniture that I will replace my smaller nightstand for 50.00. It’s a mid-century modern piece that would probably cost a mint at an antique shop. Go to your home page and under Explore, click on Marketplace to see a plethora of goodies being sold in your neighborhood and surrounding areas. There are also FB groups where you can buy, sell or trade goods in your area. Check them out too. Facebook seems to be like a great place to do this. Thanks for sharing! Great article. We will never finance furniture. Way over priced and not worth it. Craigslist is your friend people. Absolutely agree! Furniture can be fixed so you can definitely savage scraps and exercise your creativity. I hate to generalize but seriously, never enter a furniture store, not even IKEA. And I know most people don’t consider mattress as furniture (like cupboard, desk, dining chairs) but this applies to mattresses as well just the same. Amazon has great mattresses, I host AirBnB full time and I have gotten great reviews from guests who think I pay 3-5x as much as I did. I actually attempted to finance furniture after buying my first home at 23, just for my den and breakfast nook. Ironically, I accidentally paid off the entire balance when I was online trying to set up the monthly payments! I definitely had the money for it, just had a bit of a shock when I saw that money leave my bank account lol. Haven’t had the urge to finance furniture since that incident. Habitat for Humanity Restore is my favorite place for those items now, especially after NC’s furniture market samples arrive! Totally agree. Financing furniture like almost anything non-property related, isn’t a good idea. Furniture is essentially clothing for a house. Styles change and then people want to dress up their homes in the latest. I find it amazing that some folks actually switch out rooms with new pieces, then brag about how much they spent. We like basic functional pieces that last a long time. My girlfriend will love me finally admitting this, but she’s gotten me sold on the IKEA furniture we’ve had for years. Inexpensive and has held up well. My first furniture pieces came from a secondhand store and I scored a Drexel Heritage desk and chest that I’m eagerly looking forward to refinishing. Instead of bankrupting myself to outfit my home, I secured many wants and necessities through holiday and birthday gifts. But the most important element was patience. I have more than enough because I wasn’t beset with the ‘now effect.’ I think that’s the larger culprit overall. It’s crazy what people will finance nowadays! I understand sometimes it is necessary but I don’t think I could ever justify financing furniture. My husband and I were able to fill out over 3/4 of our home just from our parents’ old stuff. After that, we found some cheaper stuff from Ikea to hold us over until we can afford/want to upgrade. Businesses that rent furniture or offer financing remind me of pawn shops, pay day lenders, and Las Vegas casinos. You can’t beat the house. They know that and they take advantage of you. Stay clear! Craigslist is king! I’ve even seen brand new Ethan Allen furniture for less than half price (and it didn’t fall off the back of a truck – the owners just got a bit carried away with over decorating a new McMansion). That choice never really got a nice spot on me right from time. I think of it this way. If Mr Jerry offer Mr Tom a bottle of coffee, It must definitely be that Mr Jerry expects something in return from Mr Tom – directly or indirectly. From a philosophical point of view, no human does something with a selfless cause. So… If a company offers me a 500 bucks item for 5 bucks payment a month. Two things must happen. 2. Someone will bears the cost. Now, if the company still happens to be the one to bear the cost. Its either the CEO is a nice dunce or he just loves to be a Santa Claus. This sales method is definitely not in the financial interest of the customers. Thanks for this post Michelle. Craigslist is great for furniture. We recently had to get our daughter a twin size bed. We went to the typical furniture stores where they pressured us to buy a full set for $2,000+. We only really needed a bed. We ended up getting a similar bed for $150 on Craigslist. It’s solid wood but needed a few touch ups where there were scratches. I can’t even believe this is even an option…wait, I can. Craigslist is my definite source for buying and selling furniture! Being a new house owner and in the middle of this furniture shopping process, this really resonated with me. The husband and I have saved a sum of money ready to pay for the new pieces we are buying. And even when we voice this to the sales reps, they still recommend the 0% financing options to us… it’s like, ppl can’t grasp the idea that we just don’t want payments! We want our income to do exactly what they’re supposed to do – build wealth for the future and help us enjoy the present. Not patch up holes we dug for ourselves in the past. Thank you for sharing this!!! Makes me feel like we’re not crazy! I always saw ads for financing furniture and too thought that was crazy, but I never realized it was a weekly payment, that is insane, I’d be so stressed about remembering. I may have done some stupid things (like racking up cc debt- since paid off) but I’m proud to say that financing furniture is not one of those things. I don’t understand how someone chooses to finance furniture, I can see using a zero interest credit card or something for rewards, but you pay it off without having to pay interest. Craiglist (most used furniture can be fixed up) & IKEA have been my go to for furniture (no one wants a used mattress), though Thrift stores can be good for curtains and that sort of thing. I also shake my head when my cell provider tries to sell me on a payment plan for my phone, by the time it’s paid off the phone will need replacing it becomes a neverending cycle, would rather just pay for it upfront. 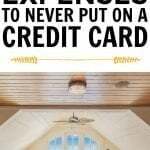 Do we need to please the visitors to our home by getting into a big sized debt? The answer is a BIG NO, because people do tend to make their home beautiful with perfect furniture fittings just to please the visitors. All we require for a day to day household furniture requirement can be bought with lesser money; it is when we go out of the way to buy a beautiful storage, bigger dining tables and a comfortable sofa we get into this unnecessary furniture financing. I don’t think financing a furniture for any purpose is a wise move. Because undoubtedly, furniture is a priced possession, and as soon as we buy it, it losses its value. In fact, after some years of use, it will make it nearly impossible to get the best the deal while selling. Again if we buy furniture, then we won’t prefer to update it over a certain period of time, just because of the high cost associated with buying. Sometimes a middle class people go for financing while buying a furniture. So, I would like to tell that if anyone really wants to improve the scale of enjoyment of his home and his life style, then he should rent furniture from well renowned supplier. So.. When I see for instance, “$68/month for this $700 bed, BUT no interest charge if you pay in full by 6 months.” Is that bad too? That sounds like a steal for me, especially when I can pay it now, but don’t have to with this kind of deal. Thoughts? Technically an interest free loan. What is to worry about beyond an unfortunate event, and not having the money 6 months from now?